Could shopping count as cardio? I just left Trader Joe’s five minutes ago and my heart is still racing. Mind you, I just walked a fast two miles at the gym a half hour earlier and my heart wasn’t beating like it is now. Was there a snow storm coming? It certainly felt like it as I tried to make my way through the aisles here at Trader Joes in Brooklyn. Really? Why can’t there be more than one? Isn’t it about supply and demand. Apparently, the demand is here in full force. Now that I’m sitting, relaxing down the street, I do realize it’s an Oscar night. Could that have been the rush? In any case my heart was beating so fast just to move without hitting anyone or holding anyone up that I couldn’t remember what I was there to buy. Oh I know! I wanted to check out the dark chocolate for the raw cacao workshops I give. I also wanted to try their vegan yogurt that someone told me about. Feeling anxious, I just quickly grabbed and tossed whatever I figured I needed and was a good deal. What’s good? I do like the produce aisle there. 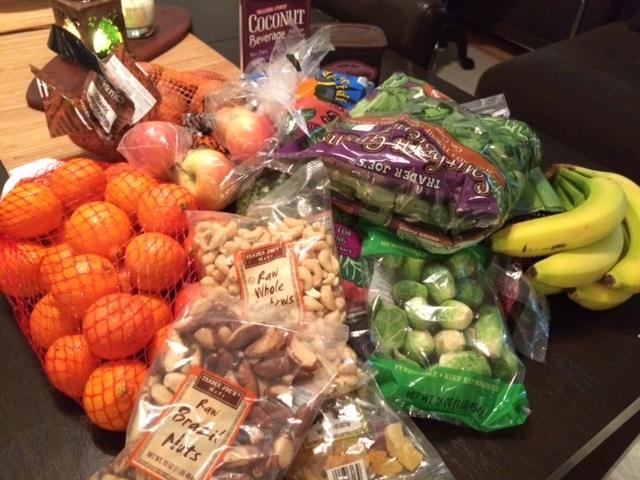 I bought lots of greens and then the bulk bags of clementines, organic apples and sweet potatoes. Where were the avocados? I guess everyone is having guacamole at their Oscar parties. I’m on an avocado hunt! I live off them and am far from thrilled about the high prices. As far as nut milks or frozen veggies – I hold out for Costco. I have to read labels here. Just because it’s Trader Joe’s doesn’t mean it’s vegan for sure and doesn’t mean it’s organic or non-GMO. I skipped over some areas like alternative meats etc. Who has time to read labels in there? I will say though that I am nuts over the nut aisle – and dried fruits. Surprisingly enough, I snacked on some dried fruits while on line and didn’t even have time to really dig in because although the line wrapped the entire store perimeter, it moved rapidly. I was out in no time with two full bags of groceries, all for under $60. I did my Grandpa proud. My Gramps shopped at Trader Joe’s way before it was cool. He went up there because the prices on the vegetables, berries and nuts were the best in town. My Gramps knew his prices and all the best bargains around. He really should have been a candidate on The Price is Right. It’s too bad he is no longer here since I’m sure we would have bonded with these great prices for healthy food. On second thought, going to Trader Joe’s is like going to the gym on adderall. Never mind, he wouldn’t like that. So does Trader Joe’s count towards cardio? Not really! Anxiety doesn’t count for real weight loss and health. Costco shopping on the other hand counts! There are much longer distances to walk and bigger carts to push. The stores are larger, it’s more relaxed and the parking is further. Seriously, you can hit your daily step goal shopping there! Enjoy! They have the best prices on nuts! !